Here’s a beautiful photo of Hurricane Irene as it makes its way up the East Cost this weekend (tomorrow is Saturday, Sunday comes afterwards). There have been a few hair-brained schemes to mitigate the intensity of a hurricane throughout the years. I say “hair-brained” because it seems highly unlikely that either of these could potentially affect the path or strength of a hurricane. It’s simply a question of the amount of energy produced by a hurricane (which is a lot) compared with the energy released by giant blocks of ice and nuclear warheads (which are comparatively small). Those are the hurricane mitigation attempts that I’d like to focus on. Because while they may be “hair-brained” they can prove to be instructive about environmental science, geometry, and calculus. Using giant blocks of ice to cool the sea surface temperature (SST). Detonating a nuclear bomb inside a hurricane. How big would a block of ice have to be to cool the SST in front of a hurricane by, let’s say, one degree Celsius? Wouldn’t a lot of that ice melt on its way down from the arctic? How much energy does an atomic bomb have compared to a hurricane? Research the amount of energy in a hurricane. Calculate the distance from the arctic to the Atlantic hurricane basin, and speed at which a naval vessel could transport the gigantic block of ice. Research the amount of energy released by a nuclear bomb. Have groups decide which method is a more feasible achievement. Well, let’s look at the energy of a hurricane. Take it away, NOAA. 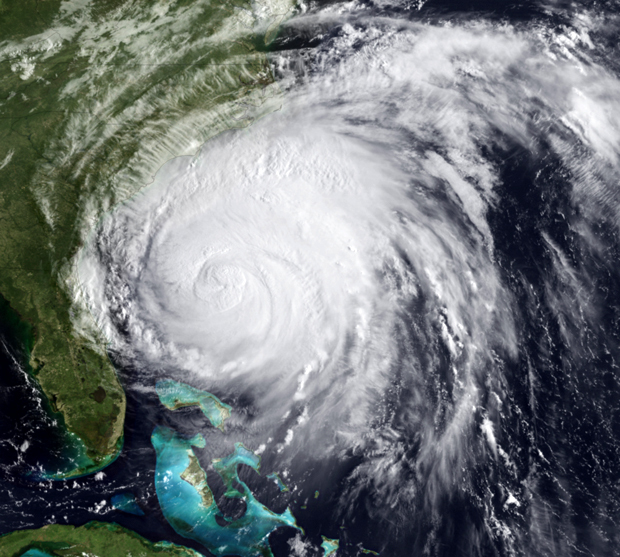 the amount of kinetic energy generated to maintain the strong swirling winds of the hurricane (Emanuel 1999). This is equivalent to 200 times the world-wide electrical generating capacity – an incredible amount of energy produced! This is equivalent to about half the world-wide electrical generating capacity – also an amazing amount of energy being produced! It would take a lot of ice to cool that much water by a single degree. And hurricanes span a lot more than 3000 sq. km. But for this instance, you would need 24,000,000,000 joules of energy from the ice. And that’s at the point of the hurricane. And that’s one degree. How big is 12,000,000 kg of ice, anyway? Another, possibly more interesting more interesting question is a calculus problem: how much ice would melt before we got it to the hurricane. Better yet: how much ice would we have to start with in order to have 12,000,000 kg of ice by the time we get to the Atlantic? Oh my ice-melting/calculus sense is tingling!